Christmas is a time of magic and merriment and Magic 4 Children has specialist children’s entertainers for Christmas parties with a festive fun party designed to reflects the holiday season and spirit. Our entertainers, Freddie Fantastic, Doodle, Bubble and Olly G each delivers a fun and engaging, season themed, audience participation orientated Christmas party formula in Cheshire and surrounds, including Stockport, Chester and Manchester. The Christmas party entertainment is perfectly suited for mixed ages between 3 – 9 year olds. The children are the stars of the celebration, guaranteeing that your Christmas Party is the one that will be remembered. As the organiser, you get to enjoy it all completely free of stress as Freddie Fantastic, Doodle, Bubble or Olly G takes care of it all. Even the prizes are included! You are guaranteed a successful event with everyone (grown-ups included) having the best Christmas Celebration ever! You get to enjoy watching all the children having the best time ever at your Christmas party while Freddie Fantastic, Doodle, Bubble or Olly G manages your whole party. This show has been specially formulated for schools, pre-school and clubs where you have Santa coming to visit and need an activity to build up to the big surprise. The younger children are enthralled with the stories, colours and funny puppets, while the older children are kept riveted and mesmerised by the amazing Magic Show and hilarious comedy as they participate in the entertainment spectacular. 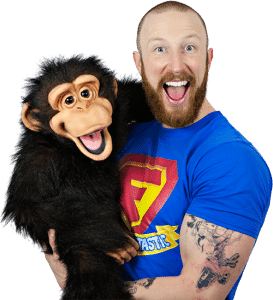 All the favourites are included and a well-balanced show is presented with a mixture of music, Magic Show, comedy, puppets, festive stories and side splitting humour aimed directly at children. Our Christmas party was excellent and the entertainment with Bubble was fantastic. The kids and adults loved her. Designed for clubs and organisations where you are needing to engage your guests for a longer period of time. Our specialist children’s entertainers, Freddie Fantastic, Doodle, Bubble and Olly G engages your young guests from the moment the first party guest arrive. Playing fun games and activities making your Christmas party a non-stop engaging experience from beginning to end. The 2 hour Christmas party formula is jam-packed with Festive themed entertainment including interactive games, dancing activities set to upbeat music, competitions, comedy, magic, puppets and prizes. The secret to success is the use of the 3 – 9 year old age group’s competitiveness of to have everyone participating from start to finish. The children are the stars of the party and are all made to feel like royalty. All this leaves you free to enjoy a stress free party at your Christmas celebration. Our Christmas party entertainment packages have been developed and perfected over 20 years and caters for a mixed age group making sure there is something for everyone. We will both entertain everyone while being respectful at all times to guarantee a party experience the children (and grown-ups) will never forget. The Christmas party magic, games and disco include a whole host of highlights: a funny speaking monkey puppet, comedy magic, engaging party games and a super kids disco. And prizes are included! Both our Christmas party entertainment options will have all the guests at your party (including the grown-ups) clasping their bellies with laughter, gripping the ends of their seats in anticipation and jumping with excitement from beginning to end. We specialise in good clean fun with age appropriate magic, music and games will have your Christmas party guests rocking the party room like in the good old days. The paper work and fine print is all covered. A risk assessment can be provided to suit your venue and our entertainers carry liability insurance and have current enhanced DBS available for inspection. We provide everything from a table to a PA system, all you add are the children, and Santa of course! Just wanted to say a big thank you to Doodles for the fantastic entertainment for our family Christmas party. She was ready to start well ahead of time and was able to adapt the show to the throng of young children which was really helpful. We couldn’t recommend you highly enough and thank you for making our family Christmas party so special this year, everyone had a fantastic time and have taken away a lot of fond memories. Understandably we only have limited availability for the festive holidays as many companies, shopping malls and Councils utilise the services of an entertainer at this time of year, so it is advisable to book as early as possible to secure your date. Our Children’s entertainers for Christmas are available to book and the 45 minute Christmas Magic show and the 2 hour Christmas Magic, Games and Disco Package travels anywhere in the Warrington, Stockport, Cheshire, Manchester and surrounding areas of the Northwest.